"Project Nim" is a twisted mirror image of "Grizzly Man." The former is about a guy who thinks he can make a wild animal human by raising it in civilization. The latter is about about a guy who thinks he can make himself a wild animal by living in the woods. The former gets tenure. The latter gets eaten. Both want to be famous. "Grizzly Man", a 2005 documentary by Werner Herzog, concerns one Timothy Treadwell, a suicidal misfit who goes to live among grizzly bears in Alaska every summer for 13 years. He videos his encounters with grizzlies and concludes that because he hasn't been eaten yet, he is one of them. He also sees himself as their protector, even though they are already protected in a national park. And then the bears decide to eat Treadwell and his girlfriend. 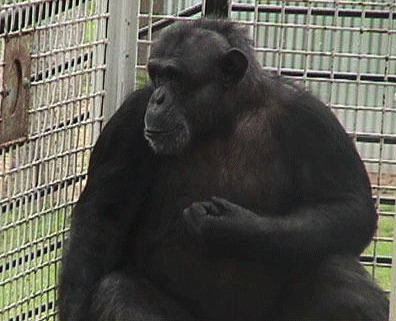 The tragic hero of "Project Nim," a 2011 documentary by James Marsh, is Nim Chimpsky, a chimpanzee who is raised by humans who think they can teach him to communicate using sign language (chimps don't have the throat structure to talk). The alpha scientist of the project is Herbert Terrace, a Columbia psychology professor who acquires Nim at the age of two weeks in 1973. Nim is violently separated from his distraught mother at the Institute for Primate Studies in Oklahoma and shipped to New York. It is clear in the movie that Terrace hadn't given the experiment or his chimp much thought. If he had, he probably wouldn't have given Nim to a family of rich, vaguely bohemian intellectuals with seven children on the Upper West Side of Manhattan. They seem like nice people, but nobody knows anything about chimps or sign language. This is also true of the press, who do a lot of soft features on the project. For 18 months, Nim wrecks the home and marriage of his surrogate parents, and becomes dangerous as he gets larger and stronger. No "science" is getting done, so Terrace moves Nim to a country estate north of the city, from which Nim commutes to a classroom at Columbia. Various student assistants try to teach Nim sign language and are lucky to escape with their lives. Fearful of getting sued, Terrace decides that he's got enough data in 1977 and sends Nim back to his birthplace in Oklahoma. He sees Nim a year later to have his picture taken for an anecdotal memoir bragging about all the sign language Nim learned. In 1979, he changes his mind and publishes an article in Science saying that Nim had learned nothing, that chimps can't learn language.